Hope you all had an amazing Easter, what a great opportunity to spend some relaxing/hectic time with family and friends. I hope you got some time to craft as well, if not lets hope the weekend brings it. I am so happy to be sharing a special DIY with all of you. 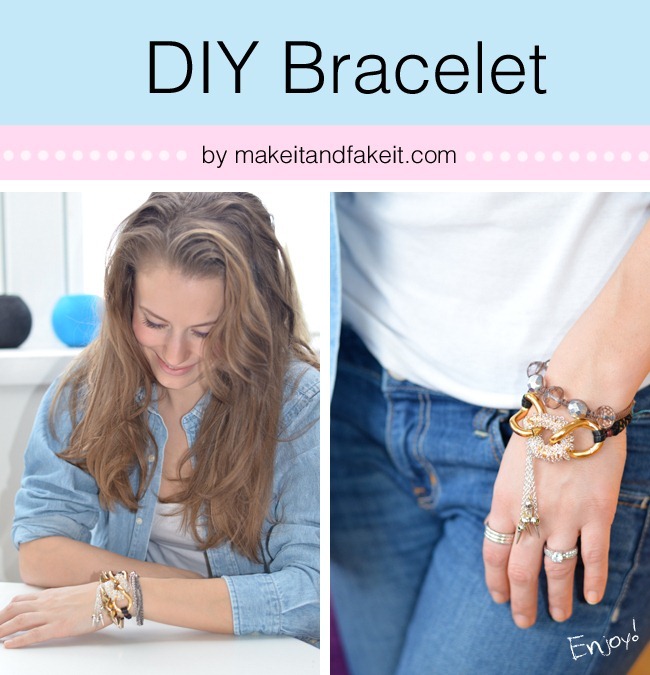 I’m going to show you how to make a cool statement bracelet. This one will look great combined with both studs and pearls (I’ve already done both and loved it!). Hopefully you will have most of the gear in your craft box, if not there’s nothing like a weekend getaway to Michaels for some goodies. Hope you are as excited as me to get started! Glue the thin silver chain to the centre link in the gold chain. This is not a necessity it just makes it easier to spin the chain around the entire link. 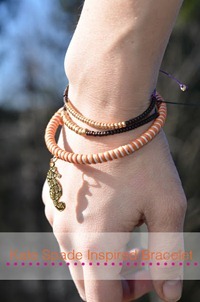 Attach the charms or beads to the end of the chains with gauge whire. Tie three pieces of leather string to the gold link with waxed string, I love waxed string, it just stays put and holds together really well. 7. Tie the lock on with waxed string. Have fun with it, I sure did! Thank you so much to the wonderful ladies of U Create for having me over, hope you guys enjoyed it as much as I did. Feel free to drop by my site make it & fake it for some more DIY or a friendly chat. THANK YOU to Katrine for sharing her amazing bracelet with us today! Very pretty and easy for someone who is new to making jewelry! Thanks!